Mercury will be at dichotomy, or half phase, on Tuesday (Aug. 28). The planet Mercury will reach half phase tomorrow (Aug. 28) and will be visible early in the morning before dawn. Mercury has phases similar to Earth's moon. At 7:01 a.m. EDT (1101 GMT), Mercury will be at dichotomy, which means that half of its Earth-facing side will be illuminated by the sun. For skywatchers on the East Coast, this will happen after sunrise, when Mercury will have faded into the daylight. However, skywatchers will have a chance to see it just above the eastern horizon for about 1.5 hours before sunrise. While the tiny, innermost planet can be spotted with the naked eye, a telescope is needed to make out its phases, according to Space.com skywatching columnist and FiOS1 News meteorologist Joe Rao. "Compared to the other planets that are currently stretched out across our evening sky, Mercury's current morning apparition displays a rather small disk ... only about 7 arc seconds in diameter," Rao told Space.com in an email. For contrast, the moon's apparent diameter is 30 arc minutes, on average. "This means that if you wanted to make [Mercury] appear through the eyepiece as large as the moon does to our naked eye, you would need a magnification of 250 power," Rao said. "While most any scope can do that, it is best to use one with a moderately large aperture ... say, a 10-inch or larger." Mercury will be visible just before sunrise on Tuesday (Aug. 28). In New York City, Mercury will rise at 4:45 a.m. local time, or 1 hour and 33 minutes before sunrise. The small planet will fade out of view when dawn breaks at around 6 a.m. local time. "Because Mercury is also at a rather low altitude in the east-northeast sky at dawn, atmospheric conditions near the horizon will likely make for rather turbulent conditions," Rao said. 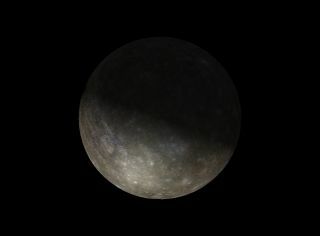 "So, it certainly is worth looking for Mercury, but so far as viewing it through a telescope, it might well be a disappointing sight (though even a somewhat distorted view should reveal that you're looking at only half of a disk)." Mercury will return to the spotlight on Nov. 6, when the planet reaches is greatest eastern elongation. This happens about seven weeks after Mercury passes behind the sun's far side on Sept. 20. To find out exactly when and where Mercury and the other planets are visible from a specific location, check out these handy calculators at heavens-above.com and timeanddate.com.